We review L’Oreal Magic Lumi Light Infusing Primer, John Frieda Color Refreshing Gloss, and Bioré Deep Pore Charcoal Cleanser. 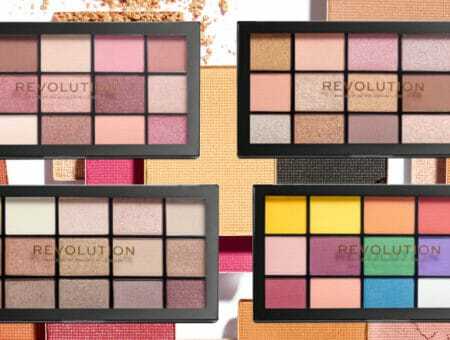 Drugstore makeup companies typically come out with new products twice a year – after Christmas and around right now. Why? I have my theory: us college girls are out of college, we have part-time jobs, and we can afford to buy new goodies. That’s probably not the real reason, but I still think it would be a pretty good one! I love primers. 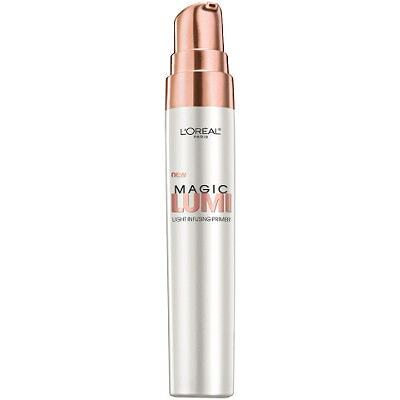 Especially primers in pretty rose-gold packaging that promise to “illuminate” and “smooth” the skin, like this one by L’Oreal. I already own the Magic Lumi Highlighter, which I’m a huge fan of, but I wanted to try this one, too. It’s not your average primer. It doesn’t have the silicone feel (which is caused by a main ingredient called dimethicone), and applies smoothly and dries quickly. This primer also leaves your face with just a hint of shimmer – enough to make your skin look more “alive” with or without foundation, but not so much that it looks glittery. I don’t normally use this all over my face. Instead, I apply the primer on the middle of my forehead, the tops of my cheeks, and the bridge of my nose, because those are the places I want highlight. Overall, this is an amazing primer, and well-worth the $13 price tag. Remember those weird shampoos and sprays that promised to “put the color back in your hair?” Well, those items left a lot to be desired, and this product actually works. 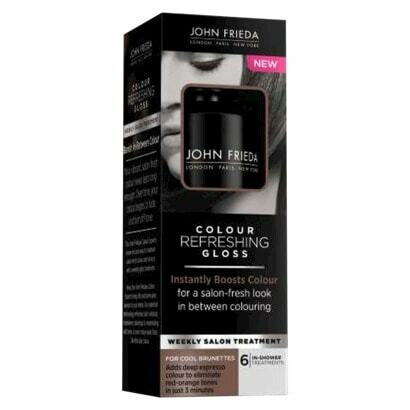 John Frieda is not my favorite haircare line, but I do love their hair glosses. Basically, this gloss deposits a bit of color and a lot of shine into your hair in order to brighten it up and take out any brassiness or dullness. I have platinum blonde hair, so I used the shade “cool blonde,” and it took out that odd red-orange tint blondes sometimes get. After you shampoo and condition your hair, you apply this product, leave it in for 5 minutes, then rinse. That’s all there is to it! I recommend wringing as much water out of your hair in the shower as you can, so the gloss absorbs easier. 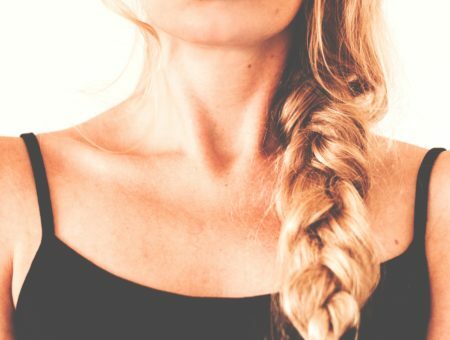 The best part is the price – you receive six treatments for $10. I can see myself repurchasing this product again. 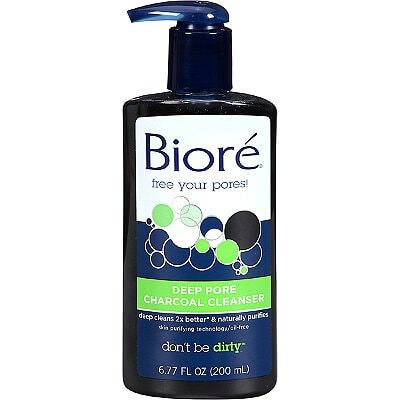 I’m constantly on the hunt for a great cleanser, and currently, I’m loving this one from Bioré! I’m taking a break from my favorite Philosophy Purity cleanser to use this, and I’m happy for the break. First of all, the scent is amazing. It’s minty and fresh, and I love the way my face actually tingles when I use it. That makes me feel like the product is actually working. I also like that this cleaner doesn’t dry out my skin, which is usually the case with deep-pore cleansers. The cleanser itself is a black-colored gel, but it doesn’t leave residue or anything, so no worries. Overall, this is a great everyday cleanser that leaves your skin feeling clean and smooth. I’m really enjoying it! Have you tried any of these products? 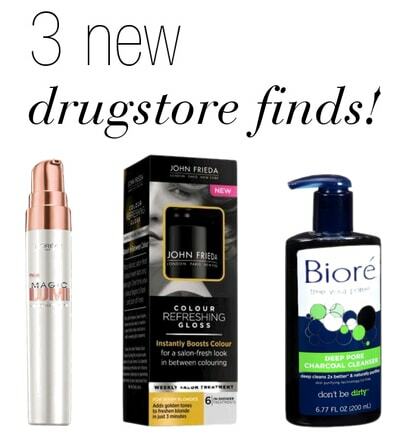 Have you bought any new drugstore beauty products recently? Would you like to see more posts like this? Remember to tell us your thoughts by leaving a comment!